What do you do when you need a Fujitsu hard drive data recovery after your drive has failed? You know you’re in need of a Fujitsu hard drive data recovery when the hard drive is showing signs of malfunction. That malfunction is then preventing you from accessing your important documents, photos, videos or folders. Issues with the flash ROM microchip are quite rare with Fujitsu hard drives. However, flash ROM chips can experience data corruption or data deletion. In this case, the board shows no signs of life or the drive operation may look erratic. In order to diagnose such fault, you have to read the contents of the flash ROM and compare it with a reference value. 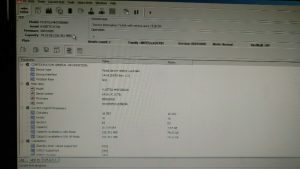 But be careful, when you compare the flash ROM contents to the reference value, you have to keep in mind the flags byte and the adaptive data as they are individual to each specific model of Fujitsu hard drive and they may turn out to be different. If the drive starts to operate and is ready, it is possible to read the flash ROM through the «Work with ROM» option of the utility. If the drive does not reach the ready status, then the flash ROM contents can be read in Kernel mode only or you need to, first, unsolder the flash ROM chip first and read it in a ROM programmer. The microcircuits sometimes suffer from the substrate separation defect and overheating of the crystal. When such malfunctions are occurring, the Fujitsu hard drive spins up normally, reports on readiness, it starts to operate and after a while, the spindle motor stops. The Fujitsu hard drive contains a microprocessor, including the reading and writing channel and interface controller. Some malfunctions of that integrated chip become apparent after overheating of the circuit, especially in the Summer, during writing cycles. In such cases, the hard drive corrupts its own service modules. Data recovery specialists can make a judgment about the operability of the microcircuit by looking at the activity in data bus lines that are connected to the ROM and buffer RAM chip. If there is no activity, it is important to check whether there are power voltage and clock generation or a steady «RESET» signal. A complete check of the integrated chipset requires the testing of the Fujitsu hard drive using PC-3000. If the hard drive does not work properly, does not report on readiness or hangs or erases the firmware modules, then the circuit is defective. In some cases, this can be corrected by unsoldering the microcircuit, soldering alloy replacement on board pads and the circuit, flushing the residue of old fusing agent and subsequent soldering the microcircuit back without forgetting to flush it. The corruption of the service data modules is a common fault on Fujitsu hard drives. Here is what happens when the drive starts to fail: the drive spins up the spindle motor, re-calibrates itself and outputs an ABR error. In order to diagnose this hard drive fault, you have to select the «SA structure test» mode in the menu and identify the defective modules in the resulting report. Alternatively, you can visually examine and estimate the service area status in the module table wizard – «Tools – Utility extensions – Modules table». Here you will be able to see straight away which modules have been read successfully and which have failed. You will also be able to find out whether the module header matches the name in the module table. You may run the wizard to read a specified set of modules and use it as the basis for a subsequent report about service data structure. What modules should you carefully watch out for? Some of the modules are critical for data protection and should not be overwritten if you wish to preserve the user’s data, for example, the modules 01h (DM), 03h (TS) and 06h (DT). The DM module contains a table of exceptions, the TS module contains the track defects’ dynamic table, the DT module contains the translator and represents a link between the logical space, defects lists, and drive’s physical space. The remaining modules are not so essential and may be re-written, but it is recommended to copy them from the same hard drive model of Fujitsu with the same service data version, for example, the modules: 04h (HS), 3Dh. Some modules can be copied from any suitable drive, namely: 08h, 09h, 0Bh,0Ch, 27h, 2Dh, 31h, 32h, 36h, 51h, 52h, 60h, 70h; however, in 95% of cases corruption influences not the whole list but just a part of it as a rule problem is in log modules, while all the rest cause read errors because of those modules. Rewriting those corrupted modules automatically restores access to the rest. Sometimes, while carrying out the data recovery on a Fujitsu hard drive, you will be in a situation when the board of the original Fujitsu hard drive is damaged beyond repair or its repair is too complicated or could take too long to carry out. In this case, it will be necessary to replace the board with another board taken from a working Fujitsu donor drive. Board swap requires a donor drive of the same family and model as the damaged hard drive. In addition, firmware versions of the hard drives must be identical. It is important to note that the best results can be achieved by reprogramming or re-soldering the ROM chip from the hard drive on which the data is recovered to a Printed Circuit Board (PCB) borrowed from another drive. 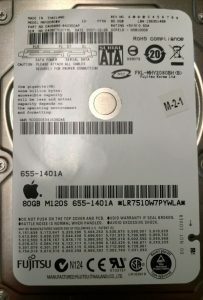 The factor is very critical because each firmware of those hard drives is unique. You need to find a suitable Fujitsu donor drive of the same family and preferably the same model with an identical firmware version. You need to swap the boards. Once this is done, you need to check that this transplant helps to restore the functionality of the hard drive ie whether it is able to report on readiness, restore access to service data modules and gives access to the user’s data which will be the best possible outcome. Solder the ROM chip from the damaged drive board to the borrowed PCB. Having unsoldered the ROM chip, read the contents of the ROM from the damaged board. For that, you can use the Kernel mode or a programming device. Then record the firmware retrieved to the donor board. Once this is done, check that the drive is functioning. During this stage, you may discover that service data modules or data in original ROM are also damaged. If the original ROM data turns out to be corrupted, try to record to donor board ROM a matching firmware version. You will use it from the PC-3000 suite database. If the drive being restored contains adaptive data, you should try to transfer the data from the original ROM or run the procedure for selection of matching adaptive data. Damages to the service data modules are very common. When this happens, the Fujitsu hard drive cannot be identified in computer BIOS. After connecting it to the PC-3000 suite the latter displays a message. It informs about the impossibility to read drive ID and an ABR error. To search for damaged modules, you will have to check the SA structure. You should start module restoration with log modules. Particularly ones with higher identifiers because that may help the drive regain access to the remaining modules. Each operation over the modules should be followed by a new check of SA structure. You can perform restoration using the «Modules table» wizard accessible from the «Tools» o «Utility extensions» menu. The tool allows you to check drive modules. You can visually examine their status (read/failed reading, etc.) together with a brief comment. The wizard also provides an opportunity to record a selected module and search the suite database. You search for version variations belonging to compatible firmware sets. It is important to note that you cannot copy some modules from other drives. And that certain modules are critical for user data and drive functioning in general. An operating system failure, a power supply failure or viral activity may activate the password protection of a drive. In such cases, the hard drive ID contains a record of password protection. But an attempt to read the drive using its logical parameters returns ABR errors for any LBA. Use the «Erase password» item in the «Security subsystem» menu to restore access to user data. This will complete the Fujitsu hard drive data recovery.